Our one-technique-at-a-time teaching style breaks everything down into bite-sized steps. We can visualize your data or equip you to visualize data yourself. During in-person workshops, you’ll learn how to transform technical findings into simple, sophisticated visuals. 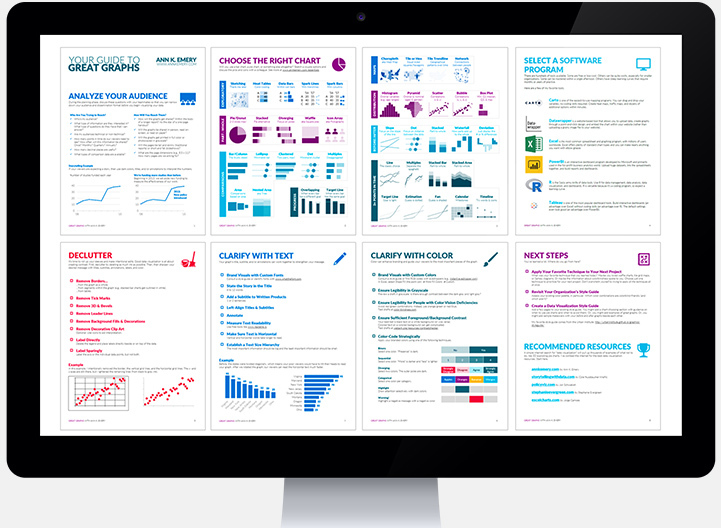 I provide workshops that focus on data analysis, data visualization, and/or dashboard design. Select one topic or mix and match. For example, we could offer Simple Spreadsheets in the morning and Great Graphs in the afternoon. Ever feel like you’re swimming upstream in data? Need to make sense of spreadsheets, but not sure where to start? Have a gut feeling that you’re not getting the most out of spreadsheet programs like Microsoft Excel, Numbers, or Google Sheets? In Simple Spreadsheets, you’ll learn to analyze your data faster and easier than ever before. Good data analysis is the foundation for good data visualization. Is your data sitting around in spreadsheets, dusty, unused, and forgotten about? Your data deserves to be out in the world: utilized, actionable, talked about. Visualizing data through charts, tables, and diagrams helps you deliver bite-sized information that viewers can understand at a glance and retain for the long run. In Great Graphs, you’ll learn how to move beyond overused charts like pies and bars and how to format your new chart so that your message stands out. We offer three versions of the Great Graphs workshop: 1) the best practices version, 2) the Excel version, and 3) the Tableau version. Why wait until the end of the year to write a lengthy report when you can share data early and often with dashboards? Your organization’s leaders have more important things to do than read lengthy reports. Dashboards get to the point so that leaders can understand the numbers and take action. In Dashboard Design, you’ll learn how to build one-page dashboards that showcase your key metrics. visualization. Sometimes, organizations choose to focus on one topic at a time, e.g., a workshop that focuses on dashboard design. Other times, organizations choose to combine topics, e.g., a morning session on data analysis followed by an afternoon session on data visualization. We can work together to design the training that’s right for you. are customized. We review your reports, slideshows, handouts, and dashboards. We might find that we should spend significant time on x topic and skip y altogether. include before/after makeovers from your real work so your staff can see how every edit makes a difference. are interactive. In sketching workshops, we remake graphs through group discussions and sketches. In laptop workshops, we provide data files-inspired by your real-life projects-so that everyone’s working from the same examples.